–Tacos Frida (Addr: 4350 Notre-Dame St W, Montreal, QC Phone: 514-316-3255). At Frida I ordered their pozole soup as well as two different tacos (el pastor and grilled beef/pico de gallo). The soup of pozole was one legit version of that soup. 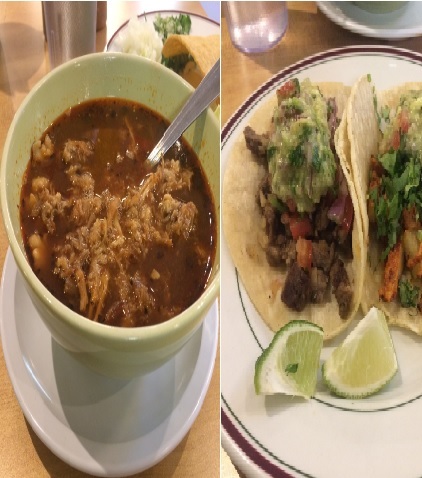 Mexican cuisine is about layers and layers of joyous flavors and the pozole soup is a reminder of that, with Taco Frida’s made of ingredients such as corn/broth of guajillo and pulled pork and served with a side of radish/lettuce/tostadas/white onions. This soup was obviously tasty, but it was limited by the average ingredients that we have in Mtl (you do realize it quickly as soon as you start dressing your soup with the lettuce and the radish, though, at such low prices, it is also what you need to expect). As for the two different tacos, they would have fared better had the meats been cooked to serve. The tacos were ordinary, but not pricey. Service is nice and the spot is clean. Loved the homey feel of the cooking, but they need to cook the meat (of the tacos) to order. Drinks: no alcohol but you have the usual soda-alike drinks of tamarind and misc tropical fruits. 5/10 for the tacos 6/10 for the pozole soup. –La Matraca (Addr: 4607 St Denis St, Montreal, QC Phone: 514-285-0777). 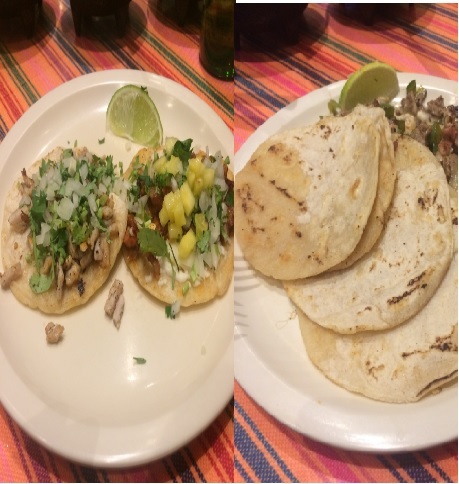 At la Matraca, I ordered two tacos (el pastor +Chuleta) and the beef Alambre bisteck. The meats were cooked to order during my visit. However, the meats were short of the exciting seasoning you came to expect from the better examples of what I have ordered. I gather that the available cheese and spicy sauces will add taste to your meat, but Mexican have long added flavor to that meat too. Still, the meats were fine enough, and I preferred my tacos here (to the ones at Frida tacos). Drinks: Beers (tecate, dos equis) , sangria, soft drinks (Sindral Mundet, Jarritos of pineapple and mandarine, etc). 6/10. 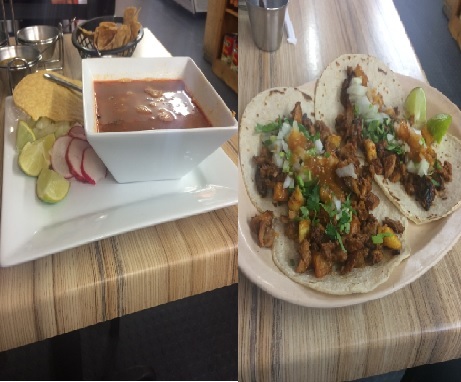 -Last but not least, I went back to a longtime local popular and highly successful taqueria, El Rey del Taco (Addr: 232 Jean Talon St E, Montreal Phone: 514-274-3336). The Pozole soup (picked the pork version as that is the most Mexican of the Pozole – they have a chicken pozole too) here was way too salty. Mexican love their pozole soup salty and my palate also likes it that way, but this was way way too salty by the standards of the palate of a Mexican. I preferred the Pozole soup at Tacos Frida. The tacos ( El pastor, I tried) came with freshly cooked meat that was exquisitely seasoned. Every single ingredient tasting of what it has to (It may sounds odd, to say so, but it is important to mention it for the simple reason that many kitchen brigades…especially here in Montreal… cook food that has the ‘ taste of everything and nothing’). El Rey was, as expected in the world class supremely dazzling and unbelievably out of this world food destination of Montreal, not present (in Montreal, the star Chefs are always present when a food journalist, a celebrity or a celebrity food blogger is visiting…because, as you know, the restaurant scene in Montreal is too good ;p ….A Chef present at all times in his kitchen? ?..pfff….that is the business of those second rate food cities like Tokyo and Paris and New York and London..Rfaol!!! …), but it did not matter in this instance. Some of the very best tacos in Montreal (7 /10 by the best tacos standards in Mtl). Yes, tacos are not rocket science, and you can do great tacos at home, but if you have to enjoy them at a restaurant, then El Rey and Escondite are among the best in Montreal. One is contemporary and hip (Escondite), the other one classic but not in a ‘tired’ way (El Rey). Of course, no one will tell you that our best tacos are better than in LA or Toronto, Lol. The world already knows that. But in Montreal, the two do rule. Bottom line: You are reminded, while eating food from all around the world, that this globe is incredibly small. I am familiar with Mexican food items since a long time (and I am talking about the real mom and pop traditional Mexican cuisine) and I can appreciate how close it is to other cuisines from other parts of the world . That is explained by the major common influences in cooking: for example, African cooking is of course found not just in Africa, but also in all the islands around Africa, the Indian ocean, in Latin America, in the Caribbean and in Mexican cuisine as well. The pico de gallo? I have it in my country (an African island) but it just have a different name and its seasoning is slightly different. The pozole soup? We have many soups of that sort in Africa too. But again, with slight differences. Mexican do definitely have a great cuisine and beautiful flavors and both Tacos Frida and La Matraca need to step up their game in order to corroborate that. Both can easily iron out the little issues I have mentioned above by cooking their meat to order (in the case of Tacos Frida, during my visit there..that was not the case) and adding lots of gusto to that meat (La Matraca cooks its meat to order, but they have to ensure that it tastes great on the palate as we came to expect from Mexican cooked meats). It is safe to suggest that La Matraca and Tacos Frida are not going to seriously challenge Escondite anytime soon ( regardless of what you think about Tex-Mex Vs genuine Mexican food …anyways Montreal is not the city you are looking for if you need to talk about that). It is certainly not their intent neither, I am sure. That said both places have friendly staff, clean premises, the Chefs and staff are Mexican, the food is not expensive (by Montreal standards) and I have no doubt that they can do better than what I have sampled when I dropped by. As for El Rey del taco, well…. by Montreal standards, as far as the tacos are concerned, they are doing a fine job. I still prefer Escondite, though.